A few weeks ago I decided that I wanted to try my hand at doing some aircraft illustrations. I’m not really sure why, but I think the thing that attracted me to this kind of art was the fact that 1). it’s a highly technical kind of art (which I enjoy), and 2). it’s a nice break from doing 3d stuff all the time. Yeah, sometimes its nice to work on other things every now and then! Once I got into it, I quickly realized how difficult creating accurate side profile art really is. Do you know how hard it is to find high-quality reference material for perfectly side-on views of commercial aircraft? It’s not as easy as you’d think. Of course there is a lot of stuff floating around on the internet, but trying to find high-res detail shots showing the little details of these aircraft is a total pain. 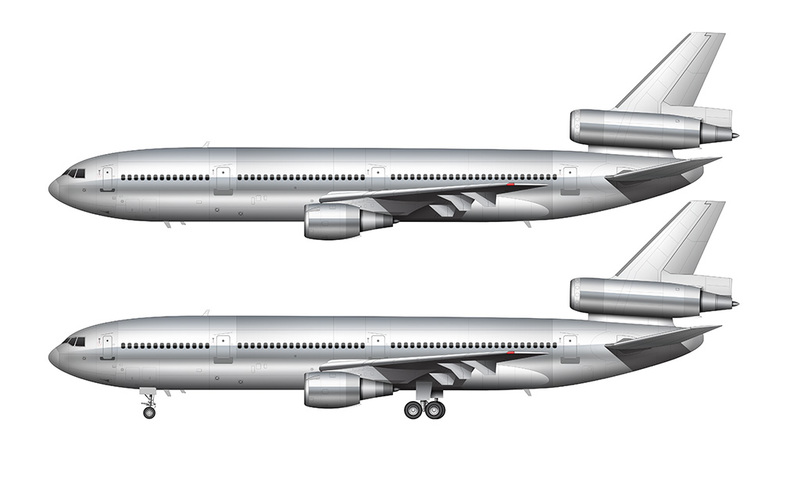 Some aircraft are more popular than others, and I quickly discovered that the McDonnell Douglas DC-10 is not one of them (compared to the newest stuff like the 777-300 and A380-800, that is). So – many of the details in these illustrations may not be totally accurate. In addition to the all white template at the top of this post, I created a few more to complete the set. First up is a detailed line drawing (below). This is actually how I start these illustrations – the line art comes first, and then I can go in and add in all the color and shadow afterwards. Once I had the line drawing and an all white blank template created, I thought it would be a good idea to create a bare metal version. 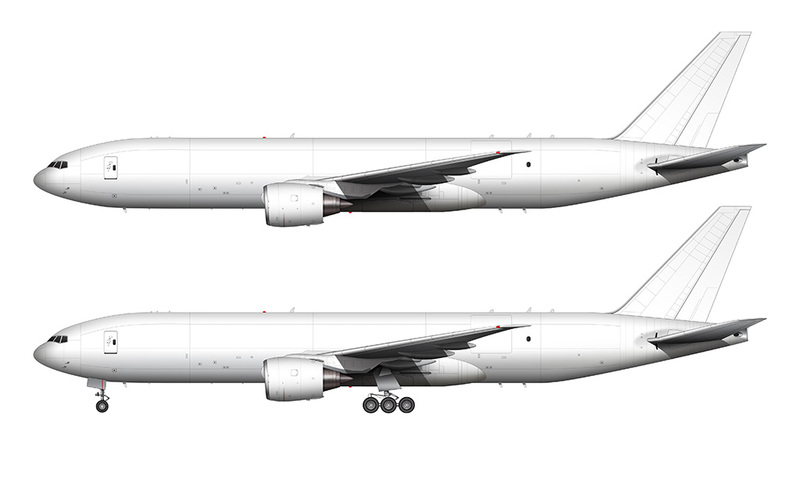 After all, a large majority of airline liveries of the 1970s and 80s featured a bit of exposed aluminum in their design, so I figured I might as well take care of that knowing that I’d have to recreate this bare metal texture in the future as I apply liveries to these templates. 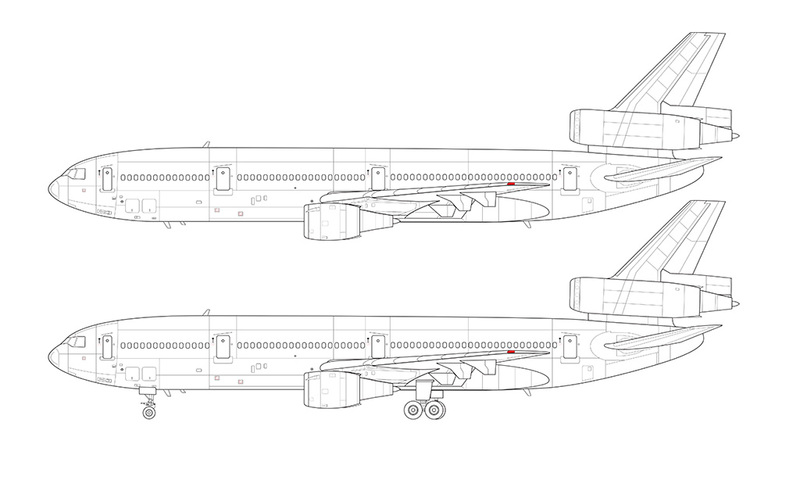 So there you have it – three blank templates of the DC-10-30. 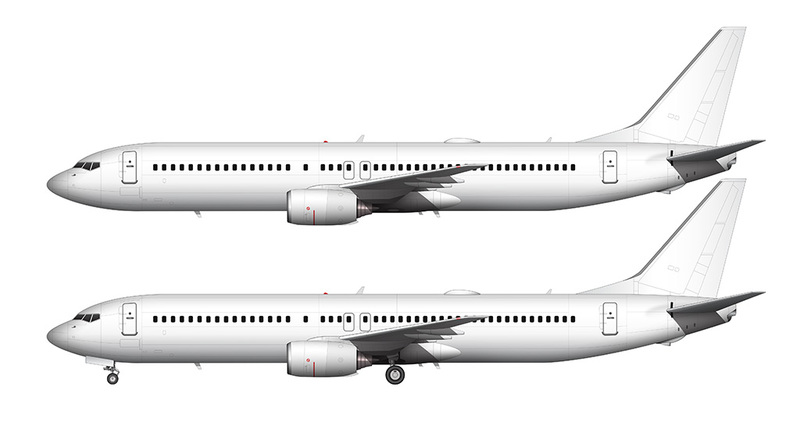 Feel free to use these for your own livery projects, and you can be sure that I’ll be posting some of my own! Scandinavian Airlines had DC10-30 for its Asia and USA flights. Had flights with this great aircraft to JFK.